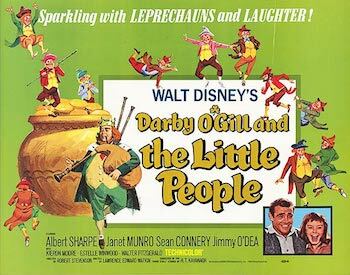 Old timer Darby O'Gill (Albert Sharpe) is employed as the caretaker of an estate, but spends most of his time at the town pub, telling tales of his efforts to capture the king of the leprechauns, so that he may be granted his three wishes. He was once successful in catching King Brian (Jimmy O'Dea), but was tricked into asking for a fourth wish, which cancelled the entire bargain. One day the owner of the estate, Lord Fitzpatrick (Walter Fitzgerald) informs Darby that he is replacing him with a much younger man, Michael McBride (Sean Connery) and that he must move to a smaller home on the property. Darby asks Michael not to tell his daughter Katie (Janet Munro) about the change yet, and introduces him to her as a new helper. Darby offers his services to the village priest, Father Murphy (Dennis O'Dea) to bring a church bell from a nearby village, but his horse runs away, up to the peak of a mountain, the site of ancient structures. The horse rears, and Darby falls into a deep well, where he finds himself in the magical world of the leprechauns. King Brian tells Darby that, having discovered where they live, he can never return home. He shows him their treasures, including a large pot of gold and a chest filled with jewels. Darby offers to play his fiddle for them, but explains that he needs to go home to retrieve it. Instead they provide him with a Stradivarius. He plays a lively fox hunt tune, and the little people leap around and dance and ride tiny horses. In the chaos, Darby manages to escape. King Brian follows him to his home, and Darby talks him into a rhyming song contest, with plenty of whiskey to help stimulate their creativity. Darby captures the drunken leprechaun and demands his three wishes. King Brian agrees, but tricks Darby into wasting the first two. Darby resolves to consider his final wish very carefully before he releases King Brian. Katie learns the truth about her father's expulsion from the Manor House and she angrily begins packing for the move. When Michael arrives, he tries to explains that Darby begged him not to tell her, and that he wants them both to stay. She eventually accepts his apology, and the two realize they are falling in love with each other. Katie tries to fetch their horse, and follows it up the mountain side. Darby and Michael go looking for her and find her unconscious and gravely injured. As she lays dying in her bed, Darby sees visions of a frightening banshee, and a phantom carriage coming for her. He demands that his third wish be that he takes his daughter's place, to which King Brian agrees. Darby enters the carriage, prepared for his final journey. King Brian arrives and again tricks him into voicing a fourth wish, negating the previous three. Darby returns home to join Katie, completely recovered, and ready to wed Michael McBride. Two more leprechaun-themed films blanc on this site are Luck of the Irish and Finian's Rainbow. 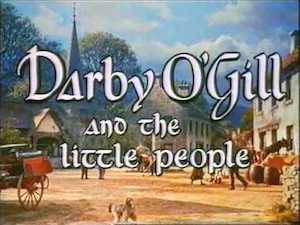 Darby O'Gill and the Little People was suggested for this site by Patrick Thomas Morgan and Karine Philippot.